ADE Green catches up with the founder of club Trouw, who managed to turn a one year sabbatical into a three year trip which caused a fundamental change in the way he sees the world and his role in it. 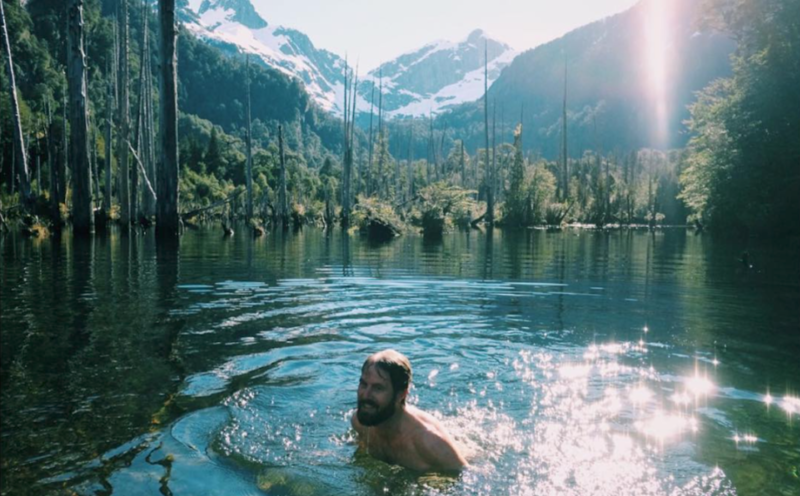 As part of a Reconnecting with Nature series ADE Green would like to share the story of Olaf Boswijk, artist, DJ, traveler and entrepreneur. As music programmer and resident at Club 11, then the man who set up Trouw and then founded De School, his contributions are woven into global electronic music culture. He has played a distinct role in Amsterdam's position as one of the capitals for electronic music today. Three years ago he started to travel with his wife and yellow van Balthasar from Canada to Patagonia. What started as an idea for a one year sabbatical, turned into a three year trip and a fundamental change in the way he sees the world and his role in it. Boswijk was inspired by the beautiful landscapes and wild nature of the Americas, but shocked by the devastating effects of climate change and globalisation. Being away from the comfortable urban and Western lifestyle he was used to gave him time to reflect and research into how they could use their knowledge and skills to contribute to a more holistic approach on the relationship between man and nature. By reading books from Alan Watts, Naomi Klein, Arne Naess, Alexander von Humboldt and Doughnut Economics from Kate Raworth during his travels his vision on climate change, our connection with nature and consumerism all tranformed. All of this came together in the idea of starting an artist residency in a remote area in Chile. A place for artists to reconnect with themselves and nature and let nature be inspiration for their work. OB: "Being in wilderness and vast desolate landscapes, away from urban societies and our online devices, gives me energy, insight, strength and a feeling of being a part of something bigger. It makes you humble, less ego- and career-driven. In many ways it gave me the opportunity to reconnect with myself and nature (which I am also part of) and to fall in love with it again. That falling in love and renewed appreciation for nature, really woke me up in the sense that I feel compelled to use whatever I can to do something positive to influence our relationship with nature. You need to love something before you can protect it." "That's a tough one. It's hard to understand, let alone feel, the connection with nature when you are in a busy day job in a city. But everything we do, eat, produce, etc is somehow connected to nature. We are made mostly of water, we breathe air, we eat food, we use fossil fuels to drive our cars or heat our houses, the list goes on and one. In my view, wether we live in cities or not, human race will have to redefine its relation to the planet – the very source of our existence – in order to sustain life on this planet. If we cannot do that, and continue to put economic growth and technological innovation first, regardless of the consequences for man, animal, plants and planet, we will simply go extinct." "There are many ways to do this. The most simple one is to breathe and pay attention to your breath. You could call this meditation, but it is the most simple way to connect again with yourself and your surroundings. Other ways are taking a long walk – forests work best – doing outdoor sports, yoga, swimming, bike rides, take a moment to look up at the sky. Nature is everywhere if you look around you and are curious enough to notice it. I also like to think that nurturing friendships, family, the community or networks you are part of is a way to think and actually act more ecological. These networks are also a form of nature and need time and attention to survive, especially in our busy fast-paced online lives." "Yes, I am trying to, although this is hard. If you look at the world in general, but specifically electronic music, we are so used to travel a lot by plane. We expect DJs to perform in 3 different countries every weekend, which obviously is not a sustainable idea. I have the feeling more artists and promotors are open to discussing this, but it is still a sensitive and also complex topic, because how do you create meaningful change in your footprint when you are a successful artist? By not flying? CO2 compensation is often controversial and it doesn't change the root of the problem. I believe artists give something positive to the world, they inspire and can bring people together. we need to maintain that, whilst reducing our footprint drastically. One way could be to champion local scenes more, just like we do with food. We want to eat organic, seasonal, local produce right? perhaps we can apply these principles to our music scenes. I think Amsterdam has a stronger scene than ever and could be a frontrunner for this." "We are in the process of starting an artist residency, or in our words: a refugio for art and research. it's located in a remote valley in Southern Chile – northern Patagonia – surrounded by a volcanic mountain range, a glacier, waterfalls, native forest and bordering Conguillio National Park. the project is aimed to offer artists, scientists, ecologists, philosophers and other makers and doers a place to find connection or reconnection with nature, time for research and space for artistic development. we facilitate research on and the development of new perspectives on the relationship between man and nature and additionally it seeks to develop an alternative, inclusive and artist-led model for nature conservation." "I would like to encourage everyone to reconsider their relationship with nature and perhaps re-establish the connection that is naturally there already. This is different and personal for everyone, of course. Like I said earlier, it's about taking the time to notice it around you and within and many of the activities I mentioned earlier can help foster the relationship. Who knows it might change the way you see the world. I think it's very important to move away from the fatalism and the negative scenarios that we will be doomed as a species anyway. We are facing huge and complex challenges, but a little bit of lightness and good spirit go a long way. But it has to be focused in the right direction. So I would like to encourage everyone to reconsider their relationship with nature and perhaps re-establish the connection that is naturally there already. This is different and personal for everyone ofcourse. Like I said earlier, it's about taking the time to notice it around you and within and many of the activities I mentioned earlier can help foster that relationship. Who knows it might change the way yousee the world and inspire you to take action in your own life." More about Olaf Boswijk? Listen to Radio Balthasar and his interview at Pakhuis de Zwijger. ADE Green, the pioneering conference on sustainability, innovation and social change in the music industry took place at DeLaMar Theater on ADE Wednesday as part of ADE Conference 2018. Topics range from "Raving for Revolution" to "The Future of Plastic". Find a program round-up here, a visual overview can be found here.